Hole in one insurance from Foresite Sports allows you to offer valuable hole in one contest prizes risk-free. When you purchase hole in one insurance, if one of your golfers successfully makes a hole in one during your golf tournament, you get to give away the prize but we cover its cost. Most coverages are only a few hundred dollars, so any outing can offer fabulous hole in one prizes that will really excite every golfer in your event. Looking to run your next promotion in an exciting and affordable way? Foresite Sports also offers a variety of prize insurance needs for any contest, game or marketing campaign. You can offer your clients grand prizes based on their own specifications, and all within their budget. Prize insurance is a great way to create a buzz about your next event and can help guarantee it will be a success! 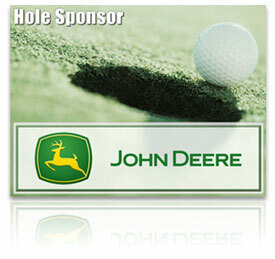 Make your sponsors proud by recognizing their support on our fantastic golf event signs. Our full-color, photo-quality sponsorship signs are eye-catching, and with our available logo printing, your sponsor's name will really jump out! Each sign is constructed to look great in any type of weather conditions too. If you're running a larger tournament, be sure to ask about our volume discounts as well. To learn more about our popular golf event signs and to find out about our pricing, click here!